Tokyo isn't really a tourist city, which is probably the only mercy that keeps it from being solicitously overcorrected the rest of the way to death. The Japanese seem to have mastered the bureaucratic discipline extracting problem-solving from its motivation and context, thus such reasonable convolutions as a token-vending machine outside a restaurant to obviate the need for people to take your money or your order, but then a greeter to help you use the machine and a waitress to take your token from you and double-check that you really want what it says. And thus the zoo, because everybody loves otters and it's not practical to go find them by tramping up and down rivers (rivers in some other country, presumably, since the Japanese have cemented all of theirs), so you build a fake riverbank and put the otter in it. Except it's still kind of difficult to take good pictures of what the otter really looks like in a fake riverbank, so you add a nice camera-level plexiglas exhibition annex and teach the otter that that's where it gets fed. 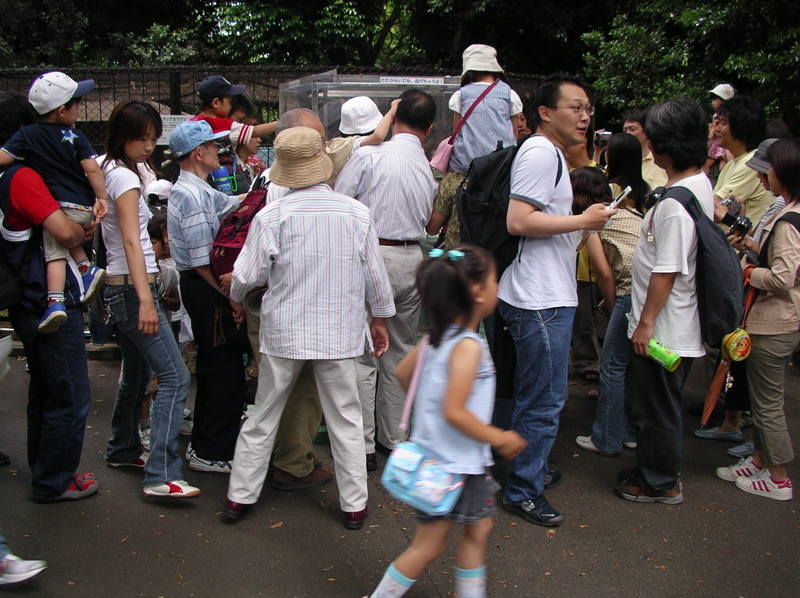 This allows at least a two dozen people at a time to crowd around and take Polish-firing-squad photographs of a bedraggled otter slumped uncomfortably in a rectangular plexiglas box surrounded on all sides by digital cameras flashing at each other and human beings squinting at the LCDs of the cameras. Plus one guy standing five meters away taking pictures in which the otter doesn't appear at all.